From cells to bodies, planets or galaxies, we’re composed of endless recurring patterns: atoms following a certain dance on the rhythms of Nature. 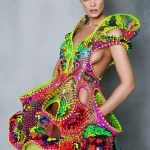 Foræva is about two designers putting the past into the future in the shape of a crystal dress. 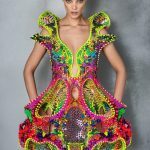 Approached by Swarovski, fashion designer Lana Dumitru and architect Vlad Tenu have teamed up to reimagine tradition for the next space age. 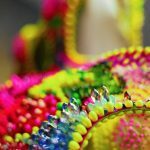 foræva is a unique dress carrying a positive and colourful message sent to us from the next century: identity and tradition will not be lost on the path of inter-globalisation, they will evolve in unexpected ways, shaped by technology and emotions. 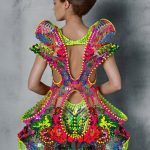 You might think of it as the dress that Grandma Earth will give to us as a goodbye gift before we leave her for other planets; or a Saturday night outfit on Mars! foræva is a story about humanity, mythology and space. It starts from the next space age and brings the ancestral tradition into the present times. It is the ancient philosophical concept of eternal recurrence but with added space age disco lights. Æva is the female character coming from the future to inspire and guide us through the rediscovery of our quintessential values. She brings a constellation of new possibilities and directions to shape our future heritage. She’s the old Eve and the future one, carrying the tradition like the most fashionable thing in the galaxy. Based on a multi-disciplinary approach, the sculptural design is achieved through completely new ways of using Swarovski elements. 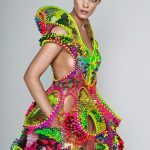 Informed by complex algorithms, the crystals are acting as structural elements as well as ornaments in order to form the fluid geometry and continuous surfaces or the dress. Simultaneously, they also behave like coloured 3D pixels, illustrating three-dimensional discrete patterns and organic reliefs. 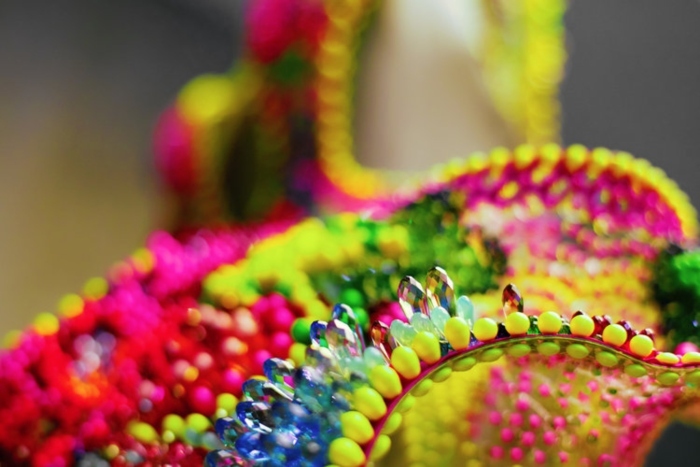 The crystals are controlled by a bespoke algorithm designed to interpret traditional patterns and re-create them from Swarovski crystals, in a similar way the traditional sewn motifs were coded and transmitted through generations. It is a process based design, creating not just one model but a family of them, fully simulated in 3D for a production dialogue with manufacturing robots rather than the human hand. 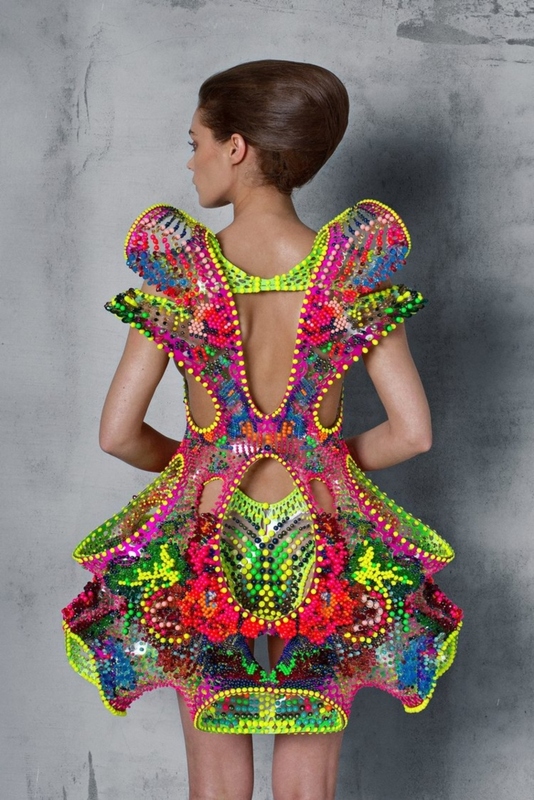 No wonder that it took a team of 15 people almost six months to assemble the dress.